After being put into bat by Rajasthan, Bangalore started very well as the pair of Virat Kohli and Parthiv Patel added 49 runs for the opening wicket. However their troubles began after the power play with the introduction of Shreyas Gopal in the seventh over. Gopal got rid of Kohli, AB de Villiers and Shimron Hetmeyer in successive overs. Kohli was bowled through the gate by a googly while De Villiers also didn’t pick the wrong’un, spooning a simple catch back to the bowler. Hetmeyer’s struggles continued, making just one from nine balls before edging Gopal to Jos Buttler. At the other end, veteran Parthiv Patel added 53 runs with Marcus Stoinis for the fourth wicket to stabilise the innings. He hit nine fours and a six in his 41-ball 67 before being dismissed by Jofra Archer. Archer however went for 17 in his final over as Bangalore managed to find another gear towards the end. 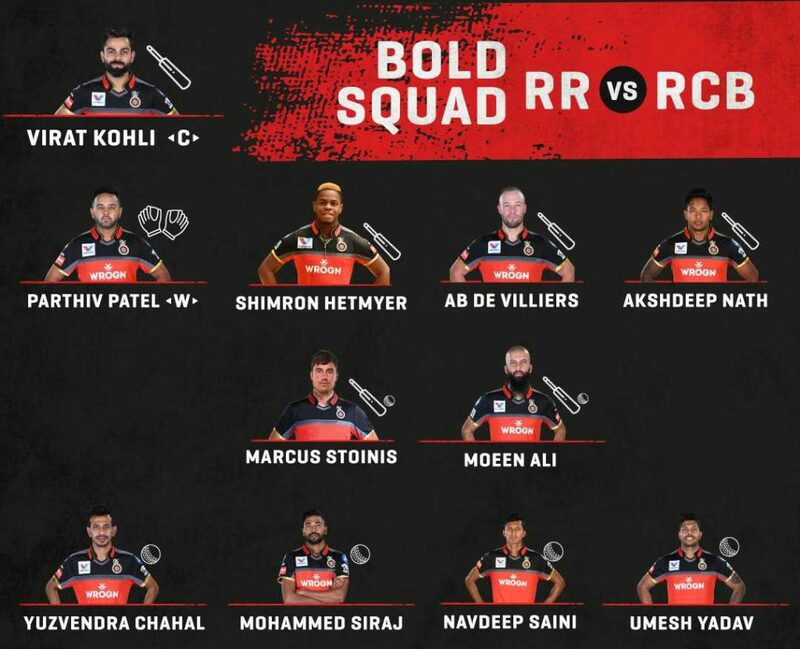 Stoinis and Moeen Ali added an unbeaten 32 run stand to take RCB to a competitive total of 158/4 at the end of their allotted 20 overs. Gopal was the best bowler for Rajasthan as he claimed 3/12 in his four overs. Chasing a modest score of 159, Royals made a steady start with Ajinkya Rahane and Jos Buttler adding 60 runs for the first wicket. Both were severe on the pacers and Rahane, who was dropped on 1 at slip by Kohli, made 22 before he was dismissed leg before wicket by Yuzvendra Chahal- another batsman who didn’t pick the googly. As Steve Smith settled in, Buttler took charge to ensure that the asking rate didn’t go out of hand. He made 59 off 43 before becoming Chahal’s second victim, with Stoinis taking an easy catch. Bangalore were poor in the field and Umesh Yadav dropped an absolute sitter in the 16th over to give Smith a vital reprieve. The former Australian skipper and Rahul Tripathi took their side closer to victory by adding 50 runs for the third wicket before Mohammed Siraj dismissed Smith for 38 in the penultimate over. 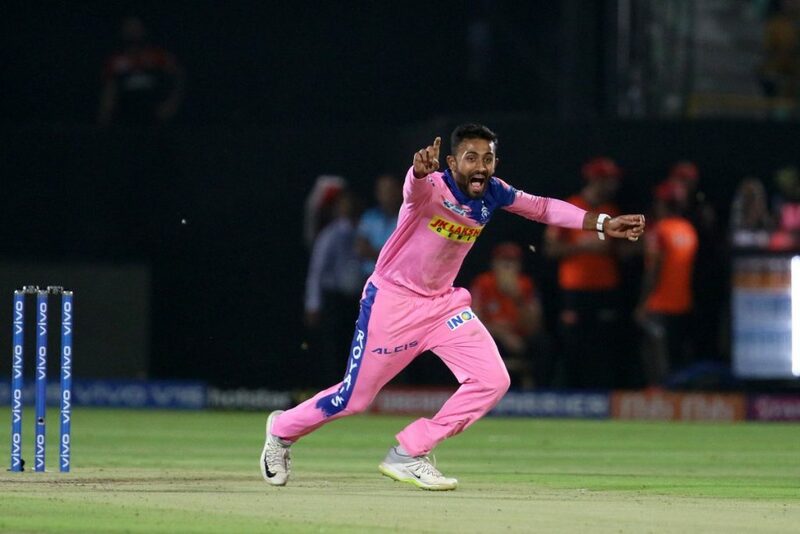 Five runs were needed off six balls, which then became two to win off 3, but fittingly it was Tripathi who finished the game, and in some style, pulling Yadav for six over deep mid wicket. There was to be no repeat of the Royals’ failed chases against Punjab and Chennai, as they finally managed to get over the line and pick up their first points of the season. The 15th game of the Indian Premier League will be played between Mumbai Indians and Chennai Super Kings at Mumbai on Wednesday.